The U.S. District Court judge in Brooklyn has required steps be taken to protect the prospective jurors, including limiting media representatives and not allowing the public to attend the jury questioning. 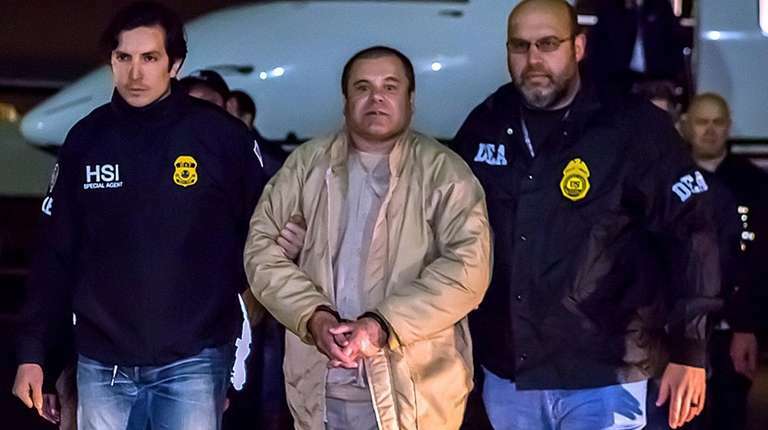 The epic trial of alleged Mexican drug lord Joaquin “El Chapo” Guzman Loera is scheduled to begin with jury selection in Brooklyn federal court Monday, but the public is not invited to the start of what could be the drug trial of the century. U.S. District Judge Brian Cogan, ruling on requests from Newsday and other media, has taken the unusual step of allowing only five “pool” reporters inside to watch the proceedings and banning the general public entirely – saying Guzman’s violent reputation and a large crowd could make jurors less than frank, despite a guarantee of anonymity. “The prospective jurors may be concerned that if they voice an unpopular or biased view, members of the public observing the proceedings – who, unlike the press, are not vetted – will connect that response to their appearance in a way that could put their safety at risk," Cogan wrote last week. The trial, expected to last 4 months, will test charges that Guzman trafficked an estimated $14 billion in cocaine and other drugs into the United States over three decades through the Sinaloa cartel he eventually controlled, using intimidation, violence and killings to protect his empire. Guzman, a near legendary figure in the drug trade, twice escaped Mexican jails, and allegedly ran his drug business from prison through intermediaries. Since his extradition to the United States last year he has been held in high-security solitary confinement, with strict limits on outside contacts. Informants and cooperating witnesses are expected to make up the bulk of the government case, and Cogan has accepted prosecution claims that many of their court filings have to be secret to protect witnesses’ identity and safety in advance of the trial. In addition to sealing multiple legal filings, the judge has also limited sketching of witnesses and ordered the jury be anonymous. The prospective jurors appearing Monday have already filled out questionnaires, and will be questioned one-by-one – outside the presence of one another to make sure their answers to questions don’t influence one another – to filter out bias and give lawyers information to use in their challenges. Cogan said in his ruling that the questioning will include matters ranging from prospective juror biases against persons of certain ethnicities to politically charged topics such as federal narcotics policy and law enforcement relations with Mexico, as well as familiarity with Guzman and his well-chronicled history. While allowing five reporters to watch, Cogan imposed two conditions: They will be excluded from private discussions he concludes need to be held with individual jurors on particular questions. And they will have to sit in the very back row of the jury box, as far as possible from the questioning. Cogan expects to complete jury selection this week. Opening statements in the trial are scheduled for Nov. 13.